I love color on both sides of the spectrum: bold, brilliant colors like turquoise and sunset orange, but also the softer colors like dove grey and delicate peachy pinks. 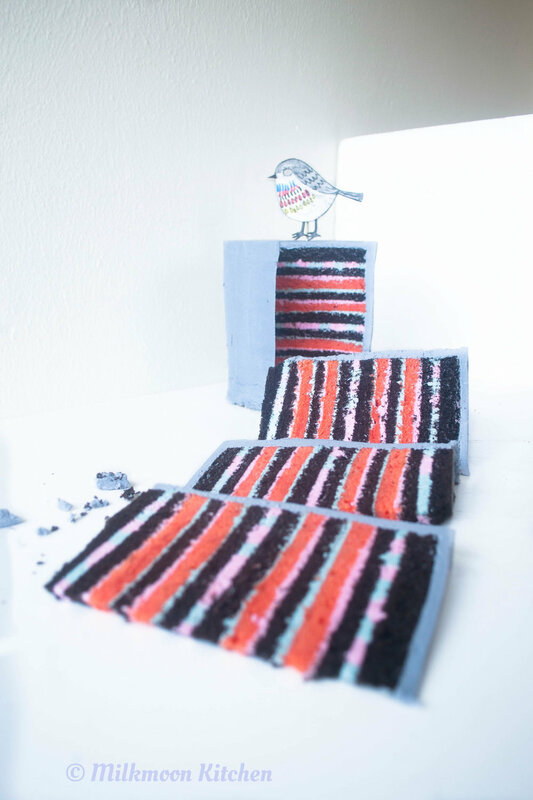 Every cake is an opportunity to play around with colors, and while I would love to pretend that I rely exclusively on the natural colors offered by the fruits, nuts, chocolate, etc. that I use in my cakes, the five-year-old inside me usually wants to get a little more crazy with it! That's when I bust out my gel colors. 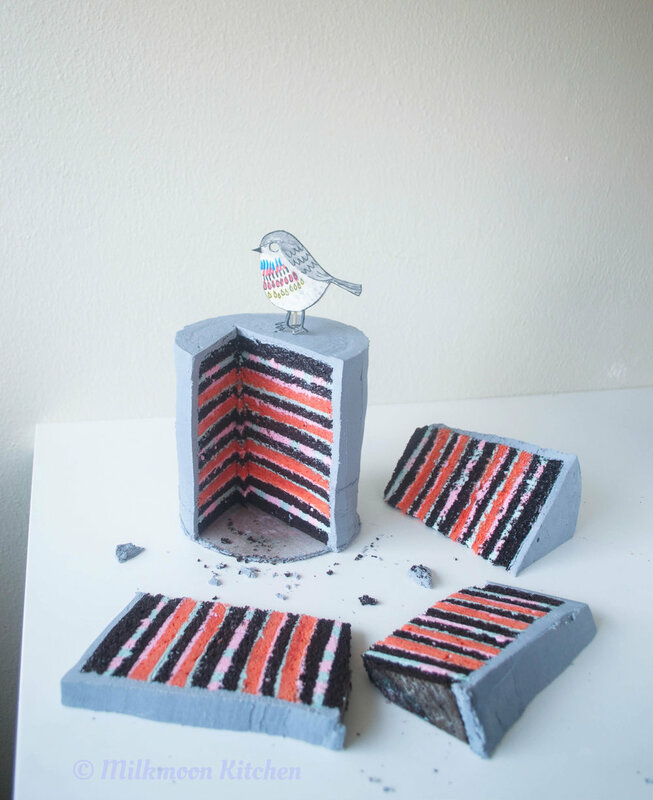 I made this cake with contrast in mind, which you can see in the set of colors on my little birdie's chest against all the softer greys of the rest of the bird and the ganached "stump" cake. I used an edible ink pen to outline and detail the bird to give it a more illustrated look. If you are tired of poorly-made edible ink pens making your gum paste and/or fondant look poorly made, get you some fine-tipped Bakerpan Food Coloring Markers; they're one of those products that will completely change the game for you if you like to doodle on your sweets. 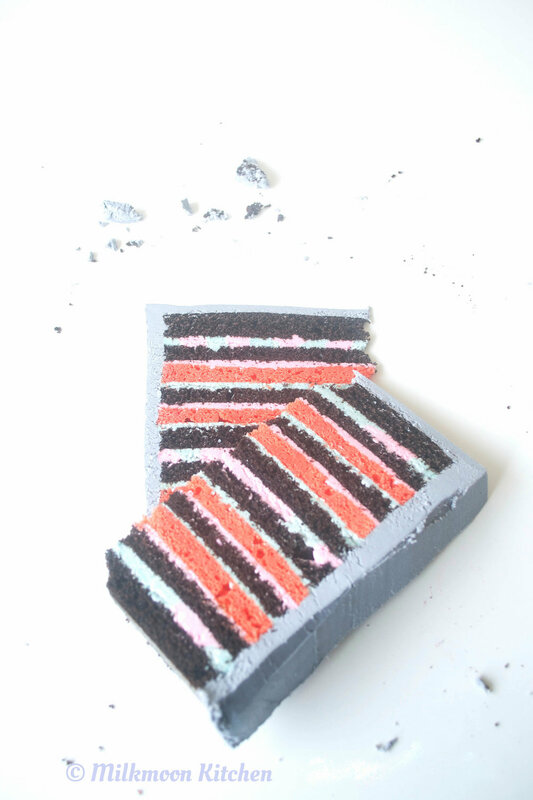 However, despite all the fanfare of the exterior, the real surprise is inside the cake! The darker cake is a chocolate buttermilk cake that came out nice and rich-colored, and I dyed sour cream cake to make the reddish-orange layers. For the buttercream I piped pink and blue concentric rings for a not-so-subtle striped look that I'm definitely going to be exploring more moving forward. I piped the rings and then smoothed them on my turntable, because I didn't want any air pockets between the buttercream and the cake; probably wouldn't have been a huge deal, but I wanted to be pretty sure that it wouldn't look terrible. I think I'll try to make the multicolored rings thicker next time so I can see the color shift better. When I stacked the whole thing together and trimmed it, it actually looked pretty good. I almost felt like I could've smoothed it a little more and left it naked, but what fun would that be? Also, ganache is delicious. 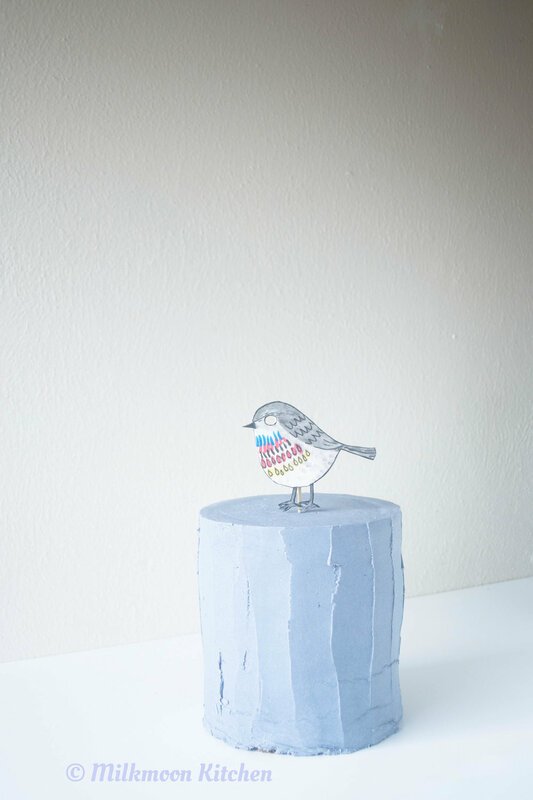 For the topper, I printed out a neat design I found on the internet and cut it out, using it to trace my birdie out of gum paste. Then I hand-painted it, adding definition with my non-sucky black food marker. I stuck it to a skewer and inserted it into the cake, and the whole thing only took about half an hour (minus drying time for the gum paste). When I get stuck and need some inspiration, I turn to color to unstick me. I love to take palette inspiration from Design Seeds, where they post curated sets of colors that can really get you going. Play around and make something unexpected! Do remember that synthetic food dye isn't something you want to eat on a daily basis, but every once in a while, indulge your inner five-year-old and go for it.